The most famous early hairless cats are probably the two cats owned by a New Mexico resident that have come to be known as the "Hairless Mexican". Most sources agree that the first breeding program for hairless cats was initiated in Canada in 1966, when a domestic shorthaired cat produced a hairless kitten. 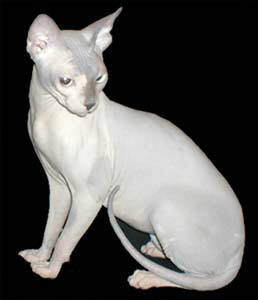 These early cats were at first called "The Canadian Hairless", "Moonstone Cats" and "Canadian Sphynx" - with time, "Sphynx" became the official name. The Sphynx cats that we have today descend from a couple of domestic shorthair farm cats that produced a hairless kitten. The hairless kitten named "Epidermis" was put into a successful breeding program in Oregon. The Sphynx cat became a recognized breed in the mid 1970's. Breeding programs in the United States and the Netherlands were based on this original line but have also continued to include hairless cats that appeared spontaneously among domestic cats. The Cat Fanciers Association (CFA) accepted this unusual looking breed for registration and competition in the Miscellaneous Class in February 1998. The Sphynx breed was developed with the help of the Devon Rex, the Devon Rex sometimes occur with sparse fur. To most people, hairlessness is a denial of everything that cats are about, and it is true to say that, although a curiosity the Sphynx has won a growing band of admirers (myself included!). It is interesting, however, that the history of the Mexican Aztecs contains stories of a breed of hairless cats which in winter developed a slight growth of hair on the back and along the ridge of the tail. Some modern Sphynxes have the same characteristics. The hairlessness, so called, because in fact the mature Sphynx has a very short downy coat which can be felt or seen only with difficulty, but no true eyebrows or whiskers - which is caused by a recessive gene. The mutation changed not only the hair length but also the body type, so that the Sphynx does not merely look like a domestic cat without hair. It looks like an entirely different species. in cats with normal coats, the hair regulates body temperature, and the Sphynx's lack of hair causes it to sweat and also makes it warm to the touch. The Sphynx has a long fine and muscular body, barrel-chested, with long slim legs and small dainty paws. The tail is long, thin and hard. the neck is is long and supports a head which is slightly longer than it is wide. The ears appear disproportionately large, wide at the base and round-tipped. The eyes are deep-set and slanted. The skin should have the texture of chamois and may be covered with a very short down. On the ears, muzzle, tail, feet and testicles, there will be short, tightly packed soft hair. The skin is very wrinkled in kittens and adults should retain as many wrinkles as possible, especially on the head. These wrinkles provide much needed insulation. The lack of a thick insulating coat makes the Sphynx very warm to the touch. Although these cats do not have hair that needs to be combed, they do secrete an oil from their skin and require frequent bathing. Sphynxes are said to be champion purrers, is very people-orientated and affectionate. They love attention! They will greet their owner when they come home and are very talkative. They are highly intelligent, playful, cuddly, often described as being "part dog, part child, part monkey, and part cat" - They like to snuggle next to you to sleep and they want to be under the covers. They have fun playing with appropriate cat toys and table tennis balls, most of all, they really love affection from their owner. Some owners have described the Sphynx as a "clown cat" - with it twisting and turning in mid-air and other antics it certainly can be a very humorous cat at times. Sphynxes are essentially indoor cats as they have so little protection from adverse weather, and they do not like resting on cold surfaces. Their body temperature is a degree or two above the average for normal cats and they have voracious appetites to compensate for the heat loss. Sphynxes have a characteristic pose, when standing, of raising one foreleg. Kittens are born with a covering of fine down which they lose as they mature. Coat colours and patterns can sometimes be seen faintly in the adult down and on the underlying skin. They come in all colour variations. The Sphynx cat requires weekly maintenance. Trim their nails as needed, your vet can instruct you on how to trim the nails. The Sphynx needs a bath once a week, use only products labeled "for cats only". Cats are very sensitive, so it is very important to use products that are made specifically for cats. it is important to dry them with a towel after a bath, and not allow them to chill. The ears need to be cleaned once a week. The proper cleaner can be purchased from your vet or a good quality petstore. Use Q-tips to clean and clean only the area that you can see. If you have not done this before, your vet will show you the area of the ear to clean and the proper method. Remember the Sphynx is an indoor cat only. Their skin is very sensitive due to the lack of hair and they can sunburn easily. If possible, make a place in front of a window where the sunshine comes in. They will likely try to get into open washers or dryers, especially ones that are warm and cosy. Try to keep the washer and dryer doors closed and always double-check before starting a wash or dry cycle. The Sphynx and allergies, contrary to what some people believe, Sphynxes are not hypo allergenic. These cats still produce the protein to which allergic people react and shed it in their saliva and dander. The lack of hair may help to reduce the reaction in some people, but others are just as allergic to Sphynxes as to other cats. Sphynx owners should receive detailed guidance from the breeder of their cat and follow their advice with great care.